I used the boat one time only but I find it too heavy to manage on my own so I am selling it for $350.00 . I paid double the amount for it. The boat is in perfect condition...brand new after all! The SUPER-TOUGH™ PVC vinyl resists abrasion and chemicals, and withstands higher air pressure. 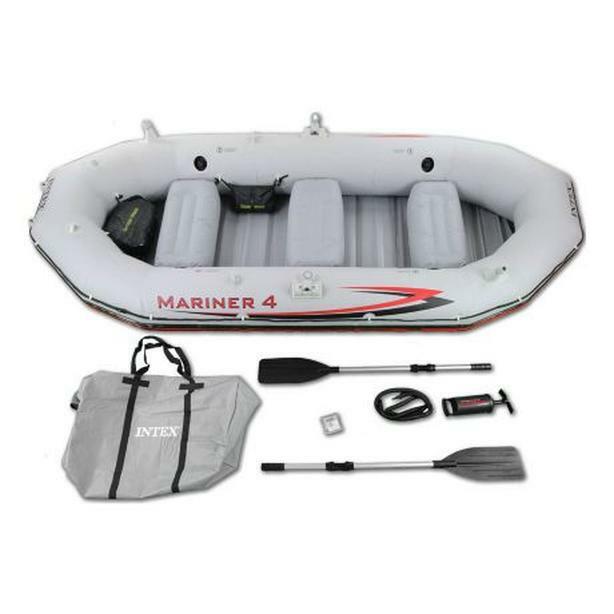 This four-person inflatable has plastic flooring, an inflatable keel, gear pouch, battery pouch, two rod holders, welded-on oar locks, all-around grab line and rock guard. Three inflatable seat cushions are included, along with 54" aluminum oars and a high-output pump. *I am including a separate Electric Pump. *CALL OR TEXT (250) 893-4031 IF INTERESTED.